The Spa Ibiza is incredibly impressive. With space for 4 people, two in spectacular parallel loungers, it is one of the most successful hot tubs in the professional range for clients seeking undeniable touches of sophistication in their businesses. 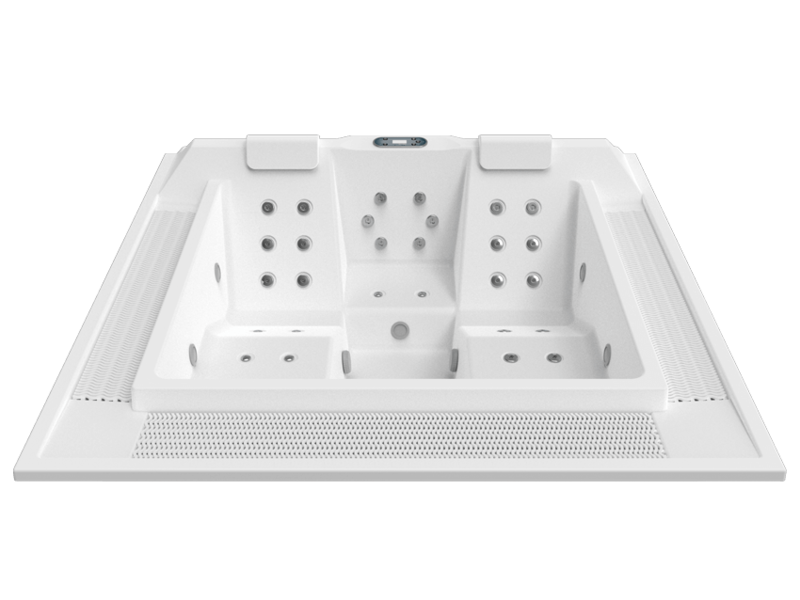 If you want to buy an exclusive hot tub with an unquestionably modern yet timeless design and top reliability, one thing is for sure: the Spa Ibiza is the hot tub for you. Its square shape with overflow systems on three of its sides (the loungers’ neck jet is higher) gives it incredible cachet, making it one of the most celebrated and popular hot tubs on the market. This is helped by finishes that are replete with surprising details, such as the comfortable headrests on the loungers and the stainless air nozzles and water jets, enhanced by its 5 underwater LED chromotherapy spotlights that generate an atmosphere of good vibes and an enveloping sensation of relaxation and disconnection. The technical equipment is installed externally and is extremely reliable thanks to the guarantee of being manufactured in-house by Aquavia Spa. It includes independent hydromassage, air injection, and filtration pumps (with a sand filter), in addition to the heating system to quickly and efficiently heat the water. A hydromassage or hydrotherapy tub can be a luxury (that is part of the fun), but on many occasions they are needed for health reasons, either physical, emotional or both. 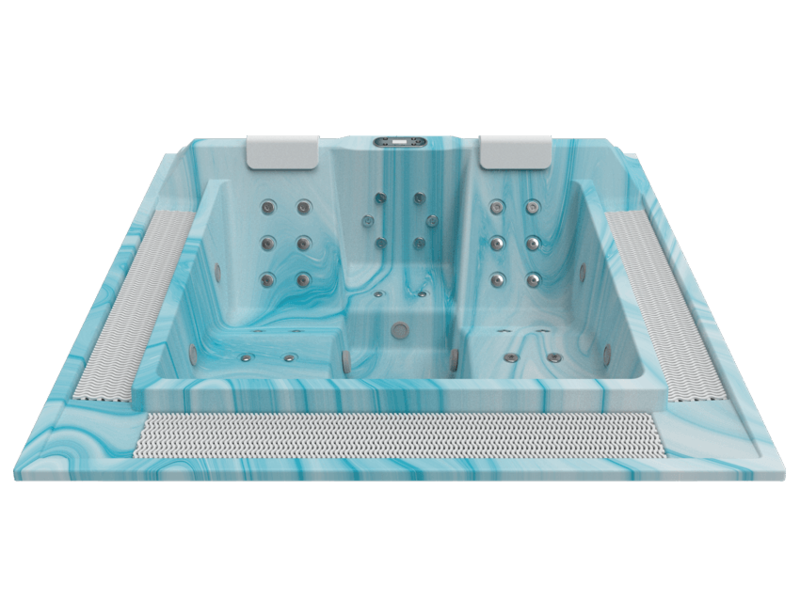 Aquavia Spa is aware of this, which is why it designs hot tubs like the Ibiza that have a distribution of jets and nozzles that has been thoroughly studied in order to improve user experience and quality of life. The positions of the jets and nozzles and their functionality (not all the jets push the water in the same direction) are designed to complement each other for muscle stress relief treatments, muscular relaxation, lipo active massages, lymphatic massages, correcting pain related to poor posture and relieving stress. The benefits of a good hydromassage are many: from improving physical performance (in sporting or everyday activities) to helping you rest better or even fall asleep. Sweet massages! Hot tub volume of water (litres): 880 l.